Acute Medical Service’s Mobile Intensive Care Unit ambulances are specialized ground units staffed by highly trained paramedics dispatched to medical or trauma scenarios where patients require a higher level of care than an ALS ambulance can provide, but do not need our specialty care or critical care Teams. 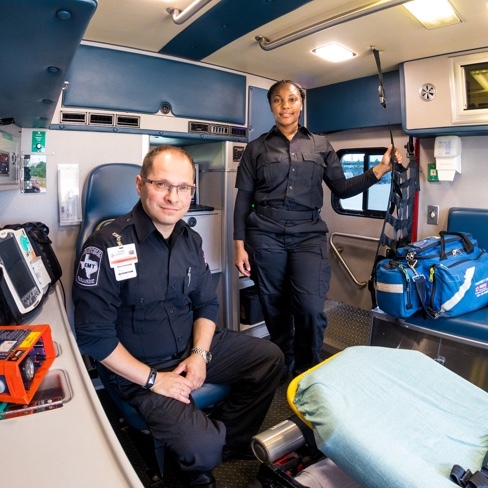 Our paramedics are trained extensively in cardiac care, advanced airway management, stroke care, emergency trauma and procedures, and life-threatening medical conditions. These MICU vehicles are equipped with advanced airway devices, a complex ventilator capable of all ventilator modes including BiPAP/CPAP, IV pumps, cardiac monitor/defibrillator, advanced pharmacology formularies and the ability to monitor invasive pressures including arterial blood pressure and cerebral pressure monitoring. For more information about our MICU services, please contact info@acutemedical.com.